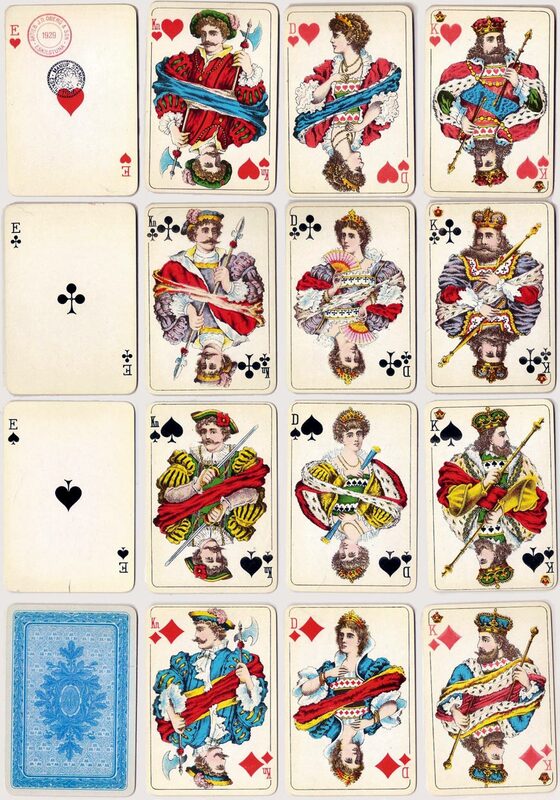 Standard Swedish type playing cards manufactured by J.O. Öberg & Son, Eskilstuna, 1929. 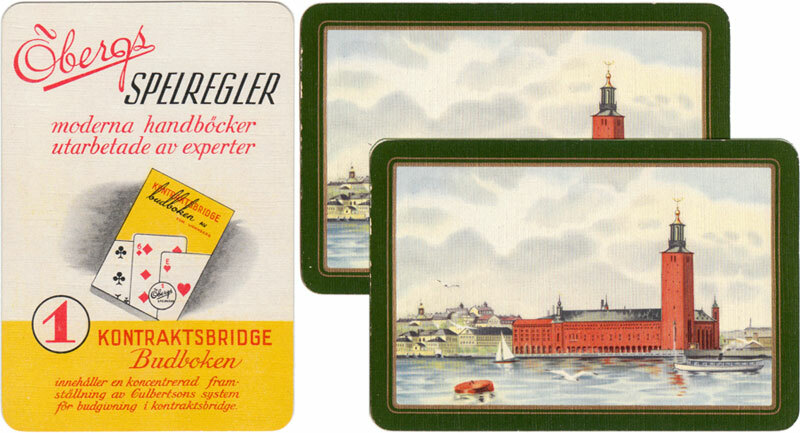 Where Sweden had traditionally produced playing cards based on the French 'Paris' pattern, more recently these have been replaced by newer designs, as shown below, which were perfected by Öberg and have become the new 'standard' pattern used in Sweden. The Ace of Hearts has the manufacturer's stamp and a tax stamp. 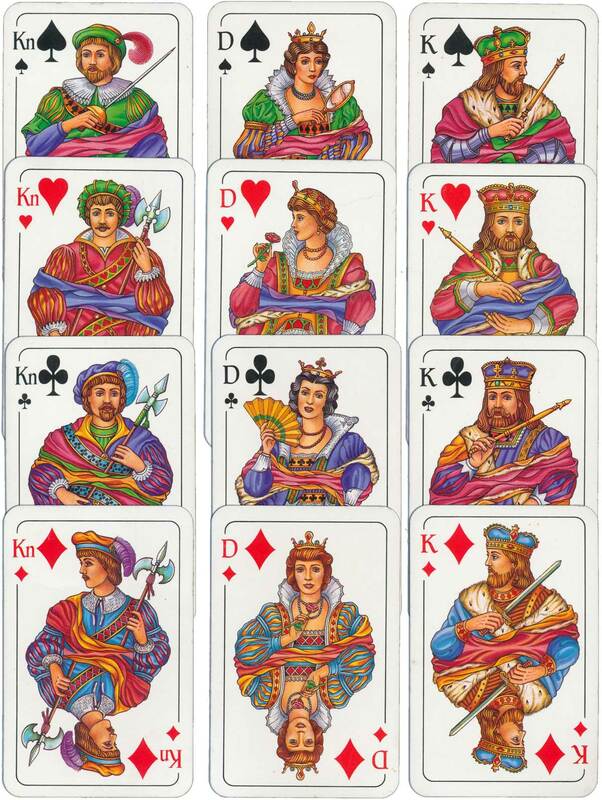 The indices E, Kn, D and K are usually seen on Scandinavian cards. The detail from the box (above right) shows a number of exhibition medals, the earliest of which is dated 1897. 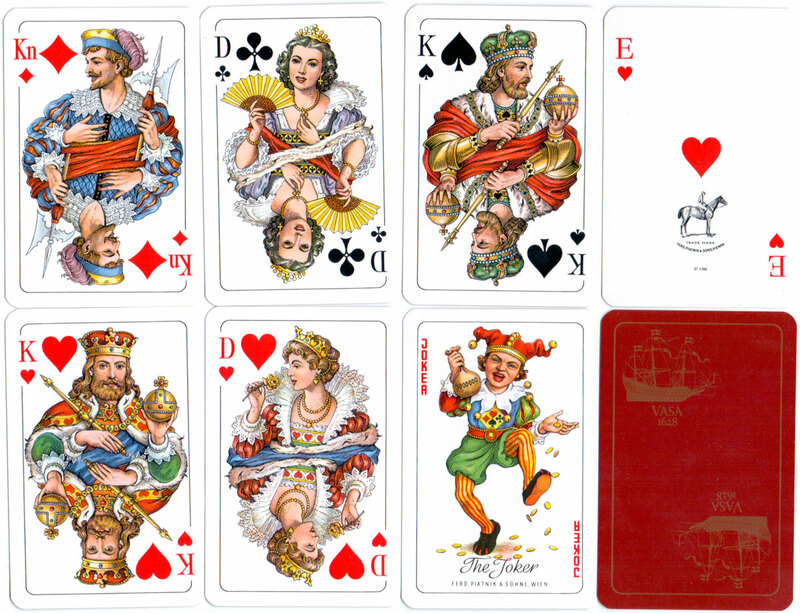 Above: Standard Swedish type playing cards manufactured by J.O. Öberg & Son, Eskilstuna, 1929. 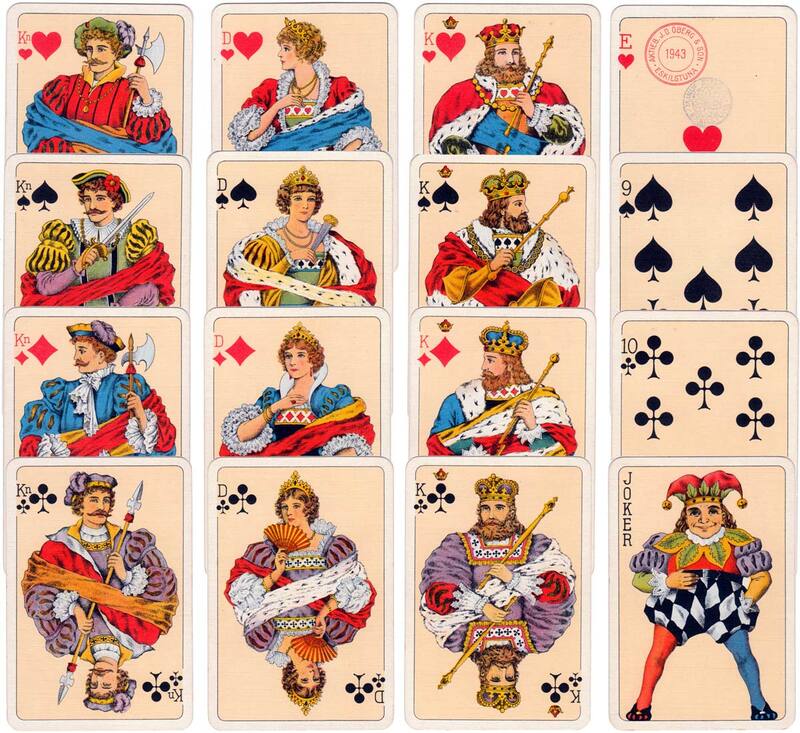 The court cards in each suit are colour-coordinated and the indices are: E, Kn, D and K.
Above: Öberg & Son standard Swedish pattern, 1943. Images courtesy Rex Pitts. 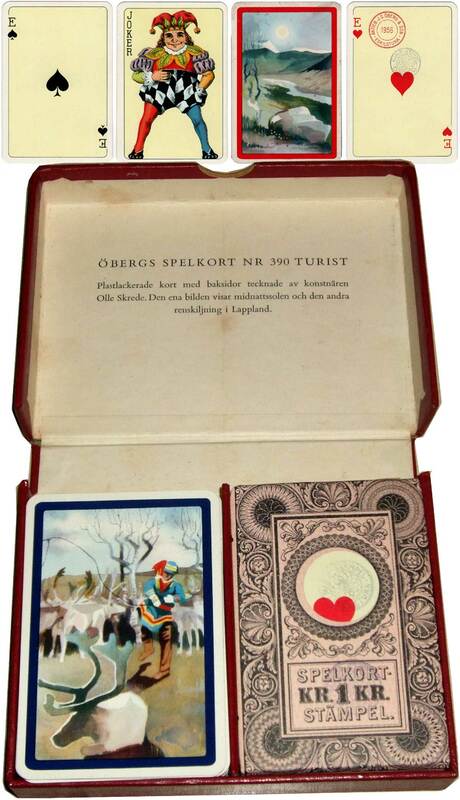 A dual set of tourist playing cards by Öbergs, dated 1956. The two designs are entitled "Reindeer in Lappland" and "Midwinter". Above: Öbergs Spelkort Nr 390 Turist, 1956. Images courtesy Matt Probert. 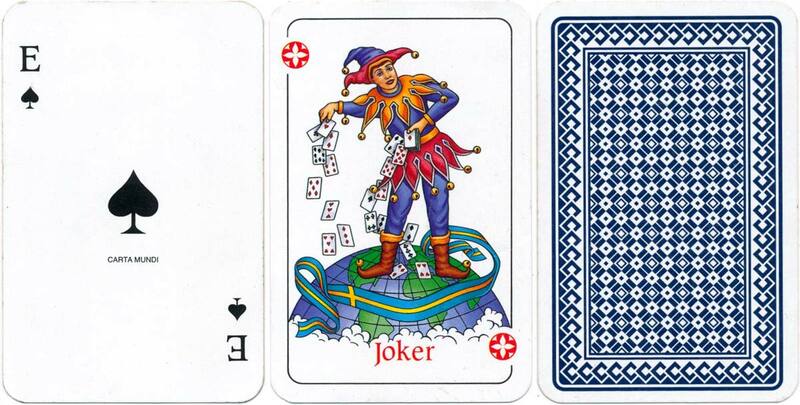 Above: Standard Swedish type playing cards manufactured for the Swedish market by Heráclio Fournier S.A., Spain, 1986. 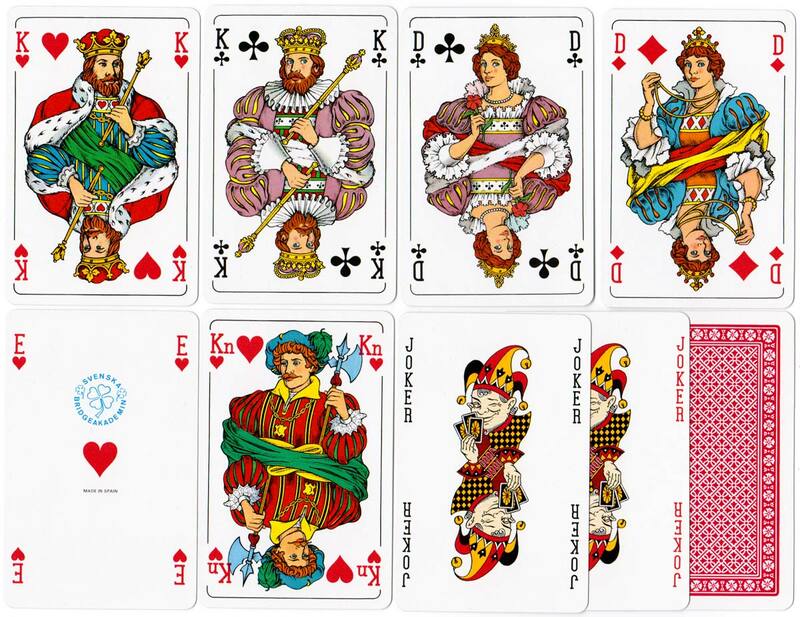 Above: Standard Swedish type playing cards manufactured for the Vasa Museum, Stockholm, Sweden by Ferd Piatnik & Sons, Vienna, 1997. In this example of the Swedish pattern by Carta Mundi, the courts have been given a make-over, but keeping a traditional (conservative) appearance. Above: Swedish pattern by Carta Mundi. Images courtesy Matt Probert.